Winter storm Jonas to bring blizzards, high winds, coastal floods to U.S.
Winter storm Jonas, the first severe such storm of the year, will strike the U.S. in the coming days, with impacts expected from the mid-South and Ohio Valley to the East Coast. Many metropolitan areas will see heavy snowfalls, high winds and there is the potential for coastal storm tide and surge flooding. Winter storms are a significant peril for the insurance and reinsurance industry, as well as increasingly the insurance-linked securities (ILS) market. In 2015 winter storms and severe winter weather caused approximately $3.74 billion of insured losses ($5.8 billion of economic losses), according to Aon Benfield’s Impact Forecasting. In fact the largest single insurance and reinsurance industry loss of 2015 was a U.S. winter storm, which caused $2.1 billion of insured losses. 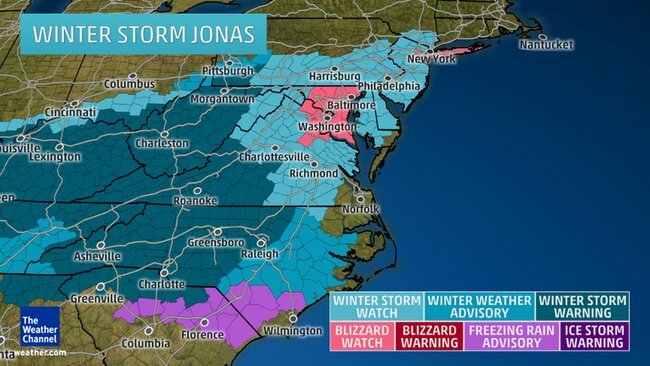 So the industry needs to keep a close eye on winter storm Jonas as it develops in the coming days. Meteorologists have been tracking this storm closely, with some suggesting it could be one of the worst on record to hit such a wide, highly populated and developed area. Catastrophe bonds are also increasingly exposed to U.S. winter storms as well, particularly in U.S. multi-peril transactions. Currently Artemis has over $2.5 billion of outstanding cat bonds listed which have exposure to U.S. winter storms, almost 10% of the outstanding cat bond market. Additionally the ILS market has more exposure to U.S. winter storm losses through collateralised reinsurance deals and private ILS transactions. 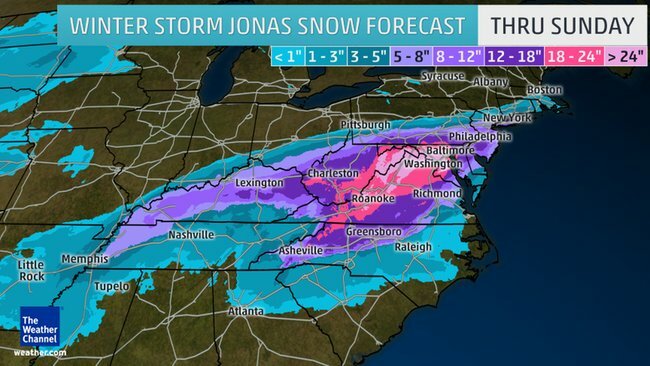 So onto the forecast impacts from winter storm Jonas. As much as two feet of snow is expected in some areas, with ten or more inches perhaps widely spread through the U.S. east coast metropolitan areas. However it’s currently uncertain how far north this will extend, although the National Weather Service has a blizzard watch out for the New York area now. Some of the forecasts for snowfall depth are extreme, with areas expected to face 20 inches or greater likely at greatest risk of higher insurance losses, due to the tendency for roof damage to properties. Winter storm Jonas will be more damaging than just a severe snow and ice event however, with the deep low pressure expected to hug the coast bringing high waves and the potential for a storm surge (perhaps more accurately a storm tide) which could coincide with some of the full moon’s highest tides of the year. The strong winds from Jonas when the storm center moves off the U.S. East Coast could drive coastal inundations for any low-lying areas, causing flooding. The tides are forecast to be higher than normal anyway, due to the phase of the moon, making any additional surge due to Jonas’ low pressure and onshore winds a real threat. Some forecasters have discussed the potential for tides to be as much as 5 feet above normal on the Atlantic coast, and the potential for coastal inundation is very real should the storm and the high-tides coincide. At least 1 foot of snow likely: Eastern Kentucky into most of West Virginia, Virginia except southeast portion, most of Maryland, D.C., northern Delaware, far southern Pennsylvania and extreme northwest North Carolina. Parts of these areas may see more than 20 inches of total snowfall. At least 6 inches of snow likely: I-95 corridor northward through New York City/Long Island, westward into the Ohio Valley and northwest Tennessee. Sharp snowfall gradient: There remains considerable uncertainty regarding snow amounts on the northern edge of Jonas’ snow shield from Pennsylvania to southern New England. These areas could see snowfall exceeding 6 inches, but confidence is not as high as areas just to the south. Ice: The highest probability of accumulating ice to the extent of not only leading to slick roads, but also some tree damage and power outages, includes parts of central and eastern Kentucky, northern South Carolina and western and central North Carolina. Lighter ice accumulation may still lead to slick roads from eastern Arkansas to southern Virginia. 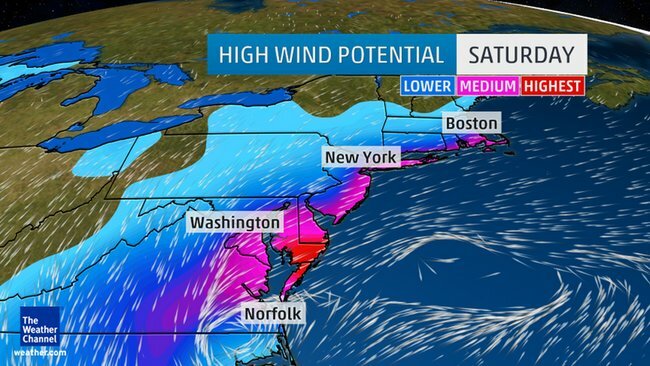 Strongest wind potential: Delmarva Peninsula, Chesapeake Bay, New Jersey and Long Island Saturday. Occasional gusts to 60 mph, coupled with the weight of wet, heavy snow in some of these areas, will likely lead to power outages, downed trees and limbs, and perhaps some structural damage. Additional strong gusts: Washington and Baltimore metropolitan areas, where blizzard conditions are possible; New England coast, particularly southeast New England, Cape Cod, Nantucket Island and Martha’s Vineyard; North Carolina’s Outer Banks. There will also be rather strong winds gusts in the Mid-South region of west Tennessee, southeast Missouri, eastern Arkansas and northwest Mississippi Friday that could also produce local blizzard conditions in spots. The combination of heavy snow and these strong winds could lead to power outages and some downed trees/limbs. There remains some uncertainty regarding coastal flood impacts, as, once again, the exact track and forward speed of the low-pressure center will dictate wind direction, wind duration and the length of the wind flow over water, or fetch, all components to determining the amount of coastal surge flooding and battering waves atop the surge. With a full moon this weekend, tides will already be running high, which could worsen coastal flooding impacts, as strong winds drive onshore during multiple tide cycles. In these areas, major coastal flooding is possible for both Saturday morning and Saturday evening high tides, with potential beach erosion and even property damage. Other areas with a chance of moderate coastal flooding include the west end of Long Island Sound, the south shore of Massachusetts, Cape Cod, Martha’s Vineyard and Nantucket Island. Thursday/Thursday night: Light snow in the central and northern Plains, with some sleet and freezing rain in the Mid-South region. By Thursday night, the Plains snow diminishes, while a broad stripe of snow, sleet and/or freezing rain develops from the Ark-La-Tex region into Kentucky, the Appalachians and adjacent Piedmont of Virginia and North Carolina. Friday/Friday night: Rain changes to snow in the Tennessee Valley and the Mid-South. A mess of snow, sleet or freezing rain spreads into the lower Ohio Valley, Appalachians, Carolinas and Virginia. Snow spreads north up the Interstate 95 corridor Friday afternoon and Friday night mainly south of New York City. Winds intensify Friday night along the coast from the Carolinas to the Jersey Shore, and near Chesapeake Bay. Saturday/Saturday night: Heavy snow in the Appalachians and parts of the Mid-Atlantic states, with some sleet/freezing rain mixed in at times. Snow will spread into southern New England. Precipitation may change to snow as far south as parts of South Carolina. Rain changes to snow near the Mid-Atlantic coast. Strong, possibly damaging winds from the Delmarva Peninsula to Cape Cod. Sunday: Snow and strong winds diminish along the Mid-Atlantic Seaboard, but may linger a bit longer in coastal southeast New England. So this winter storm is definitely one to watch and has the potential to result in a reasonably large insurance industry loss, should the effects be as bad as the current forecasts suggest. 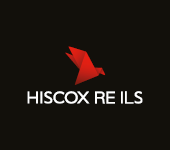 ← Older article Predictions for 2016: Susan Lane, co-CEO, Tokio Solution Management Ltd. Predictions for 2016: Susan Lane, co-CEO, Tokio Solution Management Ltd.